Peel and finely dice the mangoes and put in a large bowl. Add the coconut flesh, coconut cream, chilli, lime juice, fish sauce and spring onions. Preheat the barbecue hotplate to medium. Cut the prawn in half lengthways and remove the intestine. Season with salt and pepper and cook for a couple of minutes until opaque and just cooked through. 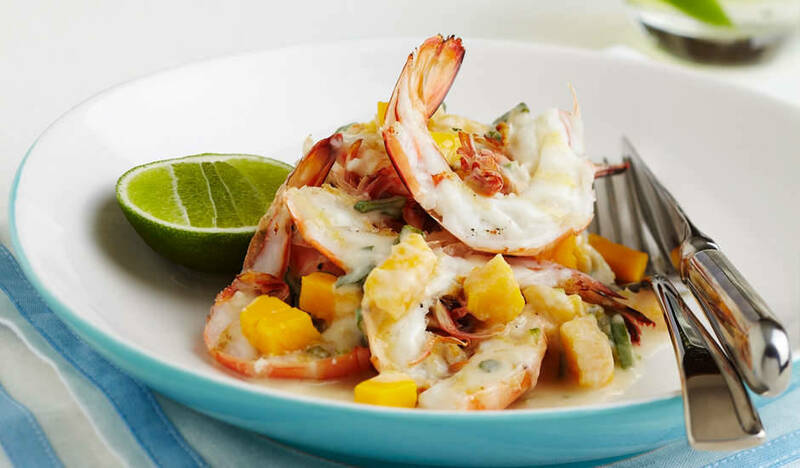 Serve drizzled with mango dressing. Tip: Ask your grocer to cut open your young coconut or, if you have a cleaver at home, you can do it yourself. Using a spoon, scoop out the soft flesh from the inside and dice.